According to global IPO investment advisor Renaissance Capital, 134 IPOs were priced in the US in the first eight months of 2018, while the volume of capital raised totaled $34.3 bln during the period, 55.1% higher than the amount of new capital raised at the same time last year. According to Renaissance Capital, the number of new deals that have been priced during the first eight months of 2018 surged 45.7% to 134 deals when compared to the same period last year. Over the first eight months of this year, 16.75 new IPOs have been priced on average every month – a higher pace than any year since 2013 and 2014 when 18.5 deals and 22.9 deals were priced, respectively. The amount of new capital raised over the first eight months of this year rose 55.1% to $34.4 bln when compared to the same period last year. The average amount of new capital raised so far this year totals $4.3 bln per month. On an annualized basis, the amount of new capital raised this year would total $51.6 bln – higher than the amount raised since the $85.3 bln generated in 2014. On a year-to-date basis, more than one-third of the IPOs (37%) came from the healthcare sector; whereas 26% of all deals priced came from the technology sector. IPOs priced in financials totaled 10%, while 8% of all deals priced came in the consumer discretionary sector. During the first eight months of this year, 167 new IPOs have been filed, 42.7% higher than what was recorded during the same period last year. 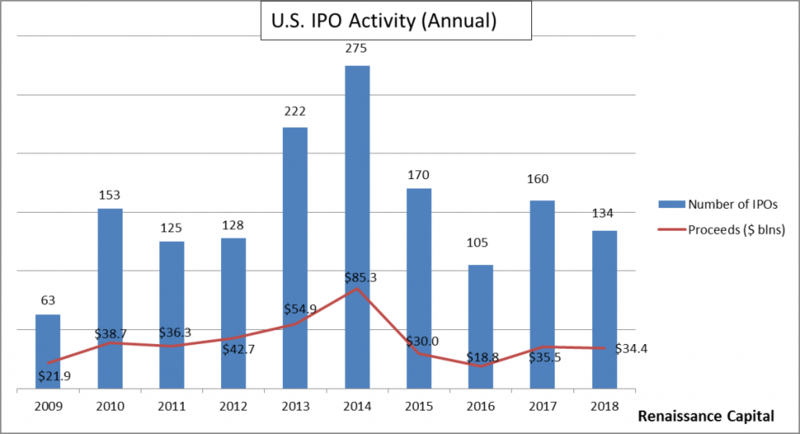 At the current pace, we would expect over 250 new IPOs to be filed in 2018 – greater than in any year since 2014 when 364 new IPOs were filed. IPO performance posted slightly weaker returns than the overall market on a year-to-date basis. As of August 30th, the Renaissance IPO Index rose 9.49% YTD compared to a 9.91% gain in the S&P 500 Index during the same period. So far this year, US IPO activity has been quite busy as increased confidence in the U.S. economy, healthy performance from IPOs, the pro-business climate of the current administration, and continued low interest rates have all been encouraging signs to corporate executives. Consequently, many analysts expect the robust IPO performance seen during the first eight months of the year will continue throughout the remainder of 2018. According to Renaissance Capital, 77 US IPOs are publicly on file as of August 30th, including 45 that have kept their filings current. This data leads their team to estimate that 70-90 more US IPOs could raise over $20 billion by the end of 2018. The projected pickup in 2018 US IPO activity should boost earnings at many investment banks. The big question is whether this renewed IPO activity will offset the weakness in cash equity trading and research revenue at many banks caused by the implementation of MiFID II. However, we suspect that the strength in healthcare and technology IPOs will continue to encourage some investment banks to boost hiring equity research analysts in these high-demand sectors.